CCP has announced Project Legion at the EVE Online Fanfest in Rekjavik, Iceland. Project Legion has been tagged as an new First Person Shooter for the PC, set in the EVE Online universe, which offers a 'true sandbox' experience. The basic experience is shoot-and-loot, with players taking assets and equipment off fallen enemies and levelling up their own character. Players can also trade items in-game. Weather-eyed FPS fans and the EVE Online faithful will notice that Project Legion bears a rather stark similarity to Dust 514, CCP's EVE-themed FPS released last year exclusively on the PS3. While the new game has used some of Dust's assets, it's a little more layered than its predecessor. Players will be offered three levels of interaction with each other. At the easiest level, there's no friendly fire between players, while on the hardest level, players can shoot their teammates and take their loot. 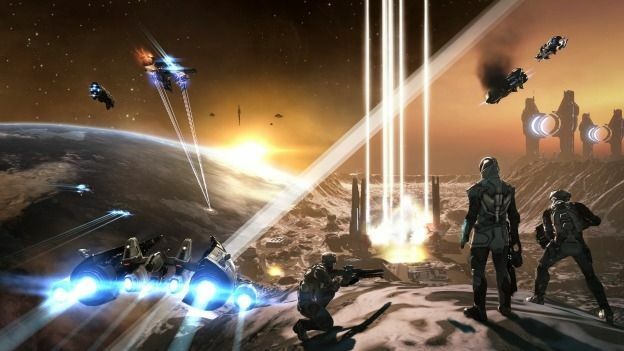 The announcement about the game landing on the PC will be music to many EVE fans, since a lot of the core CCP audience didn't bother with Dust 514, feeling that it launched on the wrong platform. CCP hasn't yet announced a release date for Project Legion, but the developer has confirmed that like its predecssor, it will be Free-To-Play.